Kyle Cerminara has the wrestling pedigree to make him a future force in mixed martial arts, but the clock is ticking on his window of opportunity as he has only competed 3 times since turning pro back in 2011. Cerminara’s wrestling accomplishments are too long to list. He was an All-American at University of Buffal in 2004 before attempting to crack the USA Olympic Team. He ultimately fell short of that goal and soon moved over to coaching at wrestling at University of Pennsylvania. In 2011, Cerminara decided he still had the athleticism to try his hand at MMA. In 2011, he won his debut fight over a very tough Ariel Sepulveda in the Cage Fury FC. Just a few months later, Cerminara won a Bellator open tryout, but strangely nothing came of it, and Cerminara never ended up fighting for them. Cerminara moved on to fight at Middleweight in his next bout, winning a decision over journeyman John Doyle. His next fight was scrapped and soon thereafter made the move to the West Coast where he joined Josh Koscheck’s newly formed camp. Cerminara won his 3rd fight, once again via decision, but has since found it difficult to find fights. He had another fight scrapped in September of 2012, and has not competed since. There were rumblings that he had moved to American Kickboxing Academy, but there was no affirmative source I could find. Cerminara originally began training at Team Balance, which is home to Bellator veterans Tim Carpenter and Gemiyale Adkins. He has since moved on to Josh Koscheck’s new training facility, the Dethrone Base Camp. Cerminara was recently featured in an episode of “Fight Factory,” which detailed some of the behind the scenes action of his current training environment. The Dethrone Base Camp has yet to really develop any big name prospects, so there is a bit of pressure on Cerminara to succeed and move on to the next level. Kyle Cerminara showed a lot of promise when he first entered mixed martial arts in 2011. Yet, over 2 years later, expectations are starting to fade as Cerminara just hasn’t been able to develop his overall game. He is a beast of a wrestler, but that same strength that earns him takedowns, also limits his speed and flexibility. Cerminara has fought at 185 lbs., but has since bounced back up to Light Heavyweight. Cerminara’s road to the UFC would likely be easier if he fought at LHW, simple because there is a lack of quality fighters competing at 205 lbs. Cerminara needs to make a decision one way or the other on which weight class he plans on competing in. He has thus far faced less than stellar competition, which has only delayed his career prospects. He’s already 30 years old, and needs to start laying the groundwork for making it to the next level. As previously mentioned, Cerminara is a fairly one-dimensional wrestler. He does have a powerful right hand, but at this point he telegraphs his punches, and he’s not going to catch anyone with it at the UFC level. His overall finishing skills are severely lacking as well. He should have been able to finish each of his 3 career opponents, but instead was forced to grind out decisions. Cerminara has been away from the cage for over a year. Hopefully, he’s been putting his work with Koscheck and improving his overall skill level. It’s still curious as to why he has not taken some fights on the regional scene in 2013. A year prior, he had 2 of his 3 fights cancelled at the last minute, and it has been well known that high level LHW prospects have routinely found it difficult to find fights. He’s likely left with only 2 choices, facing Heavyweights in catchweight bouts or making the cut to 185 lbs. 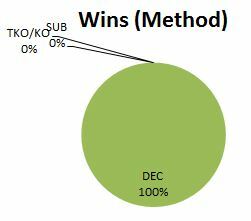 If Cerminara can get the ball rolling and score some finish wins, the UFC or Bellator will likely come calling. Cerminara has already been on Bellator’s radar once through their open tryouts. With his recent move to Dethrone Base Camp, the likely end goal will now be the UFC considering Koscheck’s contacts. Cerminara would have an extremely difficult time competing against the current roster of the UFC’s Light Heavyweight Division. His wrestling would certainly make things interesting in a few fights, but there is virtually no way he’d be able to earn a finish based on the footage I have seen from his previous fights. 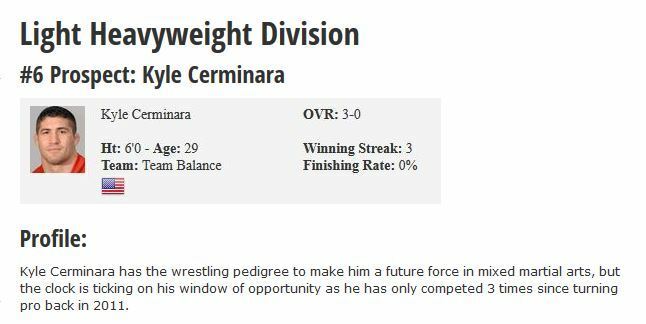 The hope is that Cerminara moves down to Middleweight where his wrestling and strength would likely be a more effective combination. Ryan Bader will ultimately prove to be Cerminara’s measuring stick. Bader’s career path was somewhat similar in that he was an All-American wrestler who was fairly one-dimensional before entering the TUF 8 house. Bader came out a fairly polished fighter with respectable power in his hands. He shows the same holes and lack of striking defense that Cerminara is currently dealing with, but the promise is there if Cerminara can get some fights under the belt and possibly get himself cast on the Season 19 of The Ultimate Fighter, which is rumored to showcase Middleweights and Light Heavyweights. Should Cerminara make the cast, he would likely be one of the favorites on the show. If he can make just some slight improvements on his overall finishing skills, Cerminara could truly develop into a Top 20 Light Heavyweight.